Last year while on my blogging hiatus, I did something crazy. 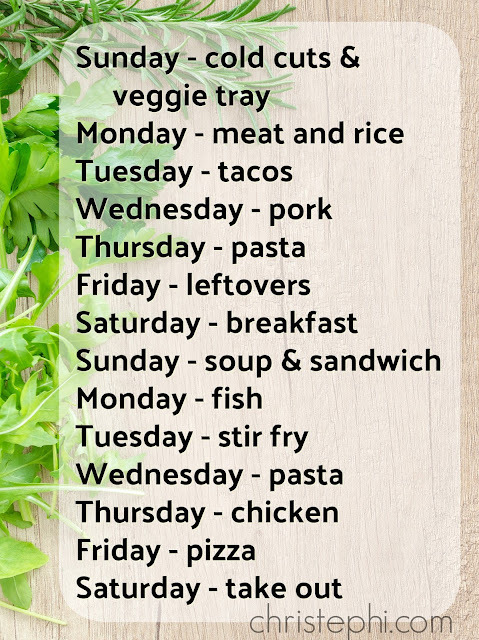 I planned meals out an entire month or more in advance! And it was heavenly. I give a lot of myself during a typical school day. My energies are consumed with many, many details. Did this child read today? Did she understand math? How many minutes did that lesson take? Do I need to supplement this topic? How long until they need a break? Did we cover everything? Is that spelled correctly? What is 7x12? How are we doing for time? Did I take my vitamins? Do we need to be anywhere today? And on and on. By the time our lessons are over, I am frequently suffering from decision fatigue. I just cannot make choices about what we will eat for supper. I will literally stand in front of the fridge or cupboard staring at ingredients for 15 minutes, then give up and order Jimmy John's. To relive myself of this burden, I have discovered that having a meal plan in place is essential. I have enough physical energy to cook supper, it's just my mental powers that are overtaxed at that point. So if I have someone or something telling me what to do I am able to accomplish it just fine. That's where my menu comes into play. I can look at it and say, "Oh, we're having fish tacos tonight," and get right to work. No decisions necessary. I love that! We like to eat a huge variety of foods, so it's not often that I will cook a meal more than once a month. I tried doing pizza night on Fridays for a while and, boy, everybody tired of that fast. 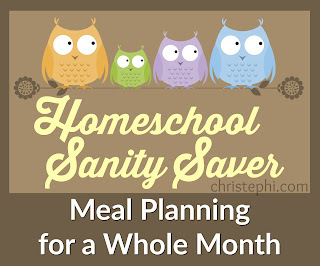 Yet I wanted some sort of method that would allow me to plan meals quickly and easily. I finally decided on a two week theme rotation, and it has worked beautifully for the past year! Each time I sit down to plan out the next month, I refer back to this basic theme. These themes are not set in stone, so if I'm inspired to try a new recipe or someone has requested something specific I have no qualms about slotting that in wherever it seems to fit. I left the categories vague enough to have a wide range of possibilities, but specific enough to narrow down my choices when I'm thinking about what to enter on the meal plan. Thursday's pasta dish, for example, could be anything from turkey tetrazzini to Korean japchae to some good down-home mac and cheese. Even the "tacos" category is loosely interpreted. Instead of just your basic ground beef crunchy tacos, I have made Cuban black bean soup, chicken flautas with cilantro-lime rice, chimichangas, and scrumptious fish tacos. Pinterest is my go-to for finding and storing the recipes I use. I have just one single Food Board so that I'm never trying to remember exactly how I categorized that recipe I pinned one time. My browser's search function or Pinterest's search Your Pins function get me the rest of the way when I'm looking for a specific pin on my board. A final word about flexibility: when I'm planning, I try to make at least one meal per week a "freezer & pantry" meal. That way if my in-laws show up with Chinese one night or I actually do order in Jimmy John's, I can skip the meal comprised of freezer and pantry items that week (they'll keep just fine as they are) and bump the other meals by one day. This prevents the feeling that my plan is ruined because I now have ingredients for a meal I won't be cooking. 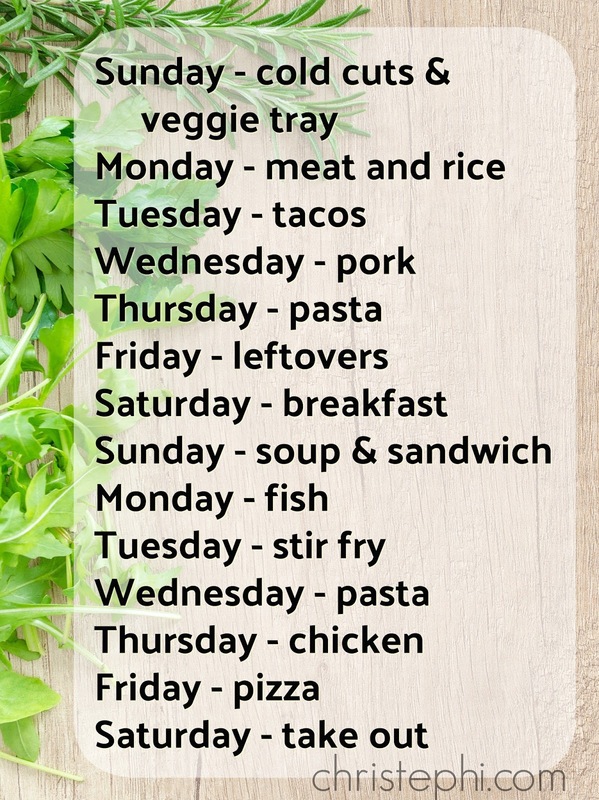 Do you use a meal plan? How far in advance do you plot out what you're going to eat? 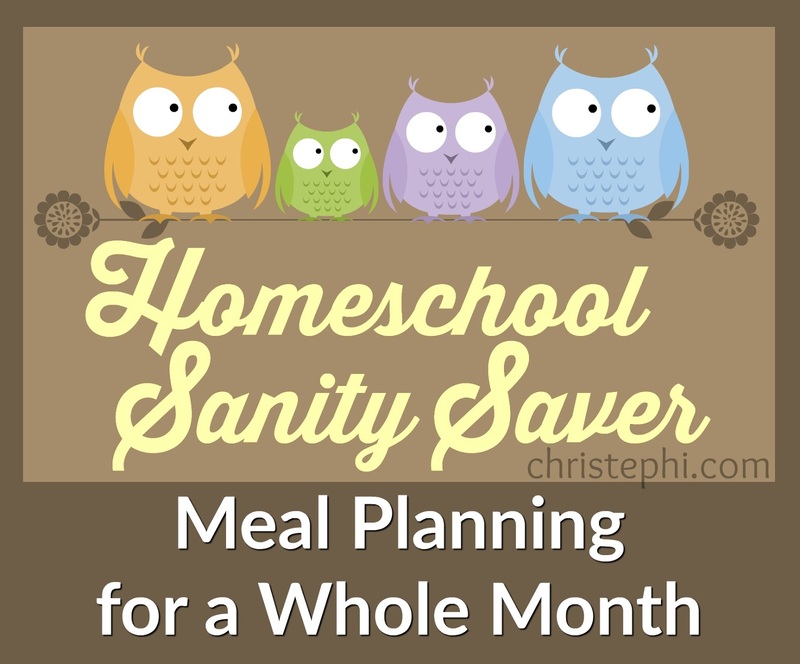 I'd love to hear what method you use to keep your sanity and feed your family. ���� Bless you for sharing! This is truly such a struggle for me, and I could not figure out why which was just as frustrating. I love to cook! So, this post was quite an eye opener!